Concrete is legendary for its toughness and that’s why its such a popular, and sensible, choice for a driveway. No area of your house cops as much traffic and impact as your driveway does. So, it makes sense to go with the most durable material out there. The best way to add to toughness to your concrete is to use concrete sealer to prime it perfectly. You’ll be happy to learn that sealing and priming your driveway is an easy process and a siloxane concrete sealer can add years to your driveway without breaking the budget. What Damages An Unsealed Driveway? Water is the greatest danger to an unsealed driveway. If the driveway is unsealed the water can penetrate into the concrete and cause it to crack under the pressure of the expansion. If you live close to the sea salt can also create problems in unsealed concrete by corroding the steel reinforcement and worsening water absorption. Wait until the concrete has cured completely—this usually takes 21 to 30 days after it has been poured. Before applying the sealant you should first sweep the driveway to get rid of any debris and dirt. After it has been swept, use a pressure cleaner to get rid of any stains or stubborn debris. If you’re using a water based sealant, you have to wait at least 24 hours, or until the driveway is completely dry, until you can start the application process. Once the driveway is dry you can spray, brush or roll the sealant on. Just use whatever tool is easiest for you. If you want to work quickly and save your back, the spray option is the best. All you have to do is get a large garden sprayer and fill it with the sealant. It’s also not as labour intensive as the other methods. If at any point you get some of the sealer on your house, car or anything else that you don’t want covered, just use a sponge and wash it off with a bit of soap and water. 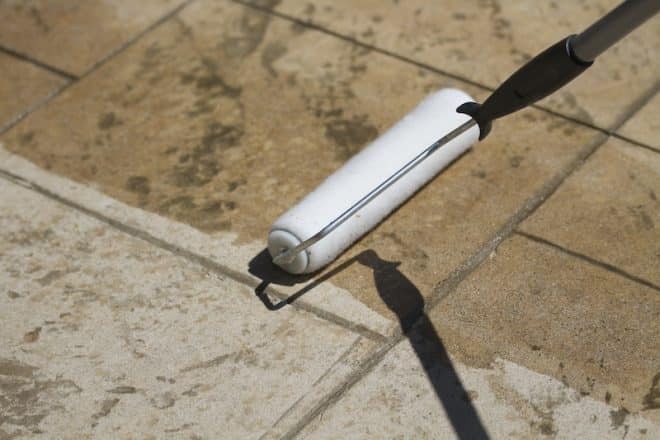 Spray, roll or brush the sealer onto the concrete until you start to see a faint, white colour. Be careful not to let any puddles of sealer sit on the concrete, you have to ensure that sealant is spread evenly across the surface of the driveway. After it is spread you have to keep the driveway completely dry for 24-hours. It’s important you keep an eye on the weather and try to seal your driveway on a day where you can be fairly certain that it wont rain overnight or the next day. How Often Should I Reseal My Driveway? Luckily, the Australian climate is pretty kind on concrete. In areas that freeze over winter, you should reseal your driveway every year, just before winter. For the rest of us, that don’t live on top of Mt. Buller, you can probably get away with resealing your driveway once every 5 to 10 years. The most important thing is to monitor the health of your driveway every now and then. If you can see pressure cracks forming or water absorbing into the concrete it’s probably time to grab the spray gun and get sealing. What Is The Best Type Of Sealer For My Driveway? There are a number of different concrete sealer options on the market. Acrylic resin based sealants are the cheapest option. Polyurethane and epoxy sealers stop moisture from penetrating into the slab but they also tend to allow water to settle on the surface, which can make your driveway slippery. The best type of sealer is a penetrating siloxane, silicone or silane sealant. These sealers penetrate into the slab and block water, oil and other nasties from making their way into your driveway. The best part about these types of sealers is that they repel moisture form the inside, meaning they don’t leave water on the surface like polyurethane and epoxy sealants do. So, there’s a rundown on sealing your driveway from the experts at Everlast Services. Of course, if you’re short on time or just want somebody else to do it all for you give Everlast a call. They’ll give you a master pour and seal to ensure that your driveway is perfectly primed for year after year of the crunch of tires, long hot days, frosty mornings and wet and windy Springs.